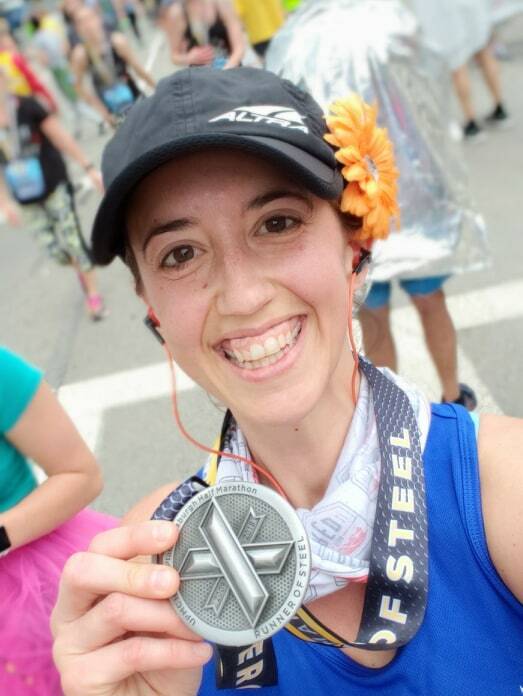 A few months ago, I ran my fifth Steel Challenge in Pittsburgh, PA. 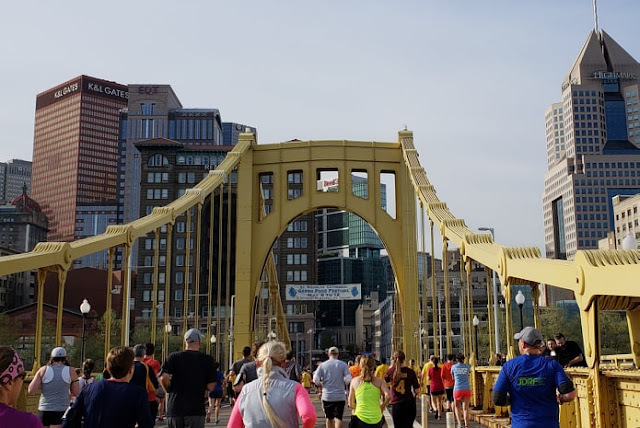 While I've participated in Pittsburgh Marathon Weekend several times before, there's just something about this race that keeps me coming back for more- and 2018 was no different! Flat runner for a 13.1 mile tour of the steel city. This year, somehow, I ran a nine minute course PR and my second-fastest half marathon ever crossing in 2:30:01. 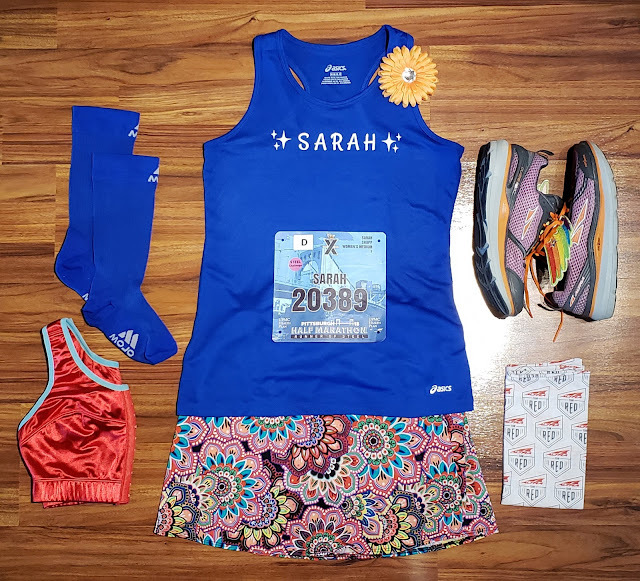 In 26 half marathons, I've only run two of them in less than 2:31. Only two! So how did this happen?? I have no idea! Seriously! You might remember that somehow I also ran a 10 mile PR in March, just a few weeks before Pittsburgh. Can't say it was training- wasn't doing much. Can't say it was speed work- wasn't doing any. Can't say it was strength training or a special diet- definitely wasn't doing this- ha! Really- I'm convinced this race and this city are magical. And this year just had an extra dose of magic. As per usual, Matthew and I met up with our running ohana early on that Sunday morning and then walked to the corrals together. Matthew and I had already decided to run separately so I dropped him off in C corral and continued walking to D corral with our friend Gloria. We had made it into the corral pretty early so we had time to kill. I wandered up to the 2:30 pace group and kinda sorta thought I would hang with them for as long as I could. The pacers told me they would be straight running (I almost always run/walk) so I already had a feeling that this wasn't going to work out. But, when the race finally started and our corral finally got up to the start line, I joined the group and tried to keep up. While the start of the race was just fine, by mile one I knew I wouldn't be able to keep up with the group. And even though I'd gone in the corral, I had to go to the bathroom again; so shortly after the mile one sign I found a short port-o-potty line and spent about four minutes using the bathroom. By the time I rejoined the race, the pace group was long gone. I put my headphones in, put my head down, and got to work chipping away at the miles. I soaked in all the sights around me, chatted with other runners (including Candi whom I met from instagram- I love the internet! ), and slowly became aware of the fact that I was in PR territory. My half marathon PR is 2:28:22 from the 2014 Shamrock Half Marathon. I know that to finish a half marathon in less than two hours and thirty minutes, each mile needs to be run at an 11:26 (or less) pace. And somehow, I was running the Pittsburgh Half Marathon with splits close to that target pace. By mile six, I knew that a sub 2:30 half was actually possible. I stopped taking pictures and focused on getting to the finish line as quickly as I could. However, I did make a few very quick pit stops for a small cup of beer, a cupcake, and a jello shot from friends at mile 10. The people of Pittsburgh really know how to make a runner feel welcome! After the boost of seeing friends at mile 10, the next 3.1 miles flew by. I was still thinking I could get a sub-2:30 if I hustled that last mile. I summoned as much energy as I could, rounded the last corner, saw the finish line in the distance and sprinted as fast as one can after 13 miles, and finished in 2:30:01, just two seconds from a 2:29:59. Check out that 10th anniversary bling. While there was just a moment of disappointment from missing the sub-2:30, overall, I was absolutely elated that I had executed a race plan that worked and led to my second-fastest half marathon ever. In fact, my last mile was a 9:47! I can barely run a 9:47 on my best day! After collecting my smiley cookie and other finisher foods at the end of the race, I walked over to the finisher's village to get my Steel Challenge medal and met up with Matthew. Will run for smiley cookies. 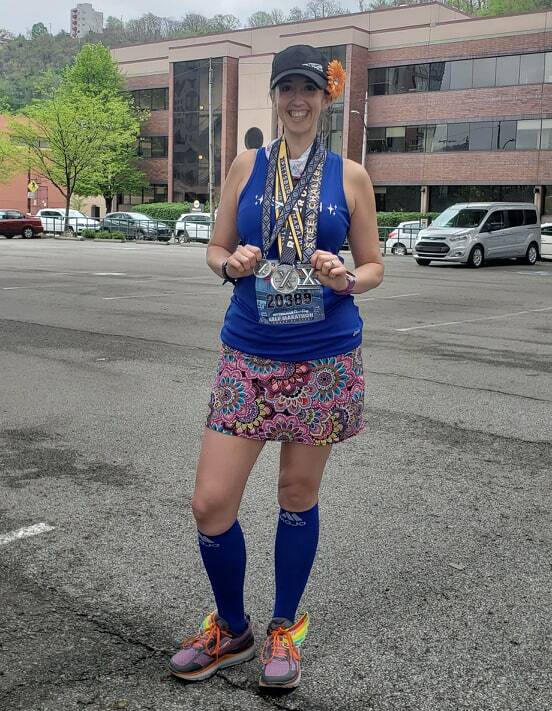 The Pittsburgh Marathon Weekend never disappoints. I am so grateful I've been able to have five years of memories and miles during this race weekend. If you are on the fence about putting this race on your calendar- don't hesitate! It's a phenomenal race weekend: well-organized, great runner swag, and challenging but fun courses. Is there a race/race weekend you've done several times? What do you love about it?